I hope you all have had a nice relaxing weekend! I had my annual piano recital on Saturday, and though I’m happy that I played well (I played Debussy’s First Arabesque), I also feel really sad since that’s probably my last piano recital with my current teacher before college. She’s been with me since the very beginning 11 years ago, and I wouldn’t be the pianist I am today without her incredible guidance (and patience- especially about my long nails!). Here’s to many more years of music where these have come from! Today’s polish is one that I’ve been meaning to share with you for quite some time but have never managed to getting around to photograph. I know I’m WAY late on this season’s Zoya PixieDust collection, but they’re so gorgeous, how could I not jump on the bandwagon? A while back, I picked up Carter from my local Ulta as a joke (my sister has a friend named Carter) and ended up being completely floored by how fantastic the polish is. Carter is a dark, amethyst-toned violet texture polish with magenta sparkles flashing throughout. Once applied to the nail, the base becomes blackened, while the magenta and violet shimmers pop against the deep purple base. It’s such a stunner! The matte nature of the PixieDust line really brings out the sparkle (seemingly oxymoronic, no?). It’s a bit lumpy to apply, but most textures are, and dries super quickly. The first picture below is Carter without topcoat, and the following is with one coat of OPI Topcoat! 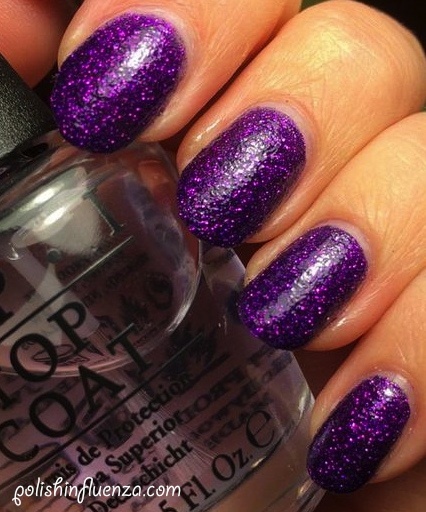 The topcoat just adds more depth to the otherwise stunning polish. However, I think I prefer the matte original version. This polish is just a unique gem that shouldn’t be marred by topcoat. What are your opinions on this gorgeous lacquer? Let me know in the comments! 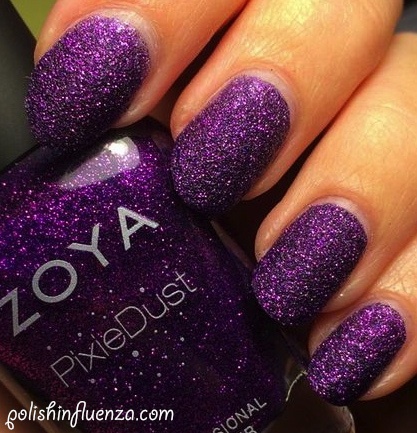 Zoya PixieDust polishes retail for $9.00 a bottle (slightly more expensive than their regular formula counterparts) and can be found at beauty supply stores, select salons, and on their website, here. Oh yeah, and be sure to follow them on twitter (@ZoyaNailPolish) for some awesome giveaways, and their weekly Tune Tuesday competition! Categories: MOTD, Zoya | Tags: amethyst, Carter, magenta, MOTD, nail polish, OPI, PixieDust, purple, texture, Zoya | Permalink. 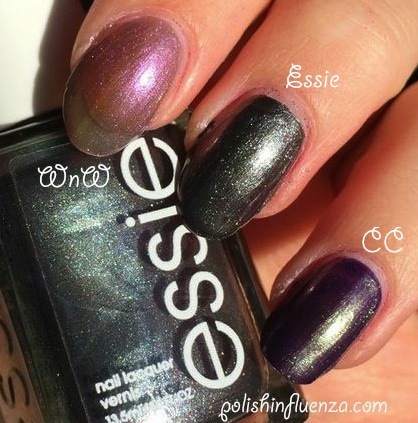 I know I tend to favor showing cool-toned polishes on my blog, but those polishes are in my favorite color group. Purples, teals, turquoises, purples, and blues (along with cold metallics like ice white and shimmering silver) dominate my stash. While I do have plenty of polishes in every color of the rainbow, my favorite ones to share are those of my favorite colors, and today is no different! Today I have Wet n’ Wild’s Caribbean Frost to share with you. It’s a metallic-y teal color pretty evenly balanced between a blue and green base (if anything, it leans ever so slightly green). Though it appears as though it would be similar to Zoya Giovanna, the two are very different- Giovanna is much greener in its base, and really isn’t so much metallic as it is shimmery, whereas Caribbean Frost is all metallic. It does have some brushstroke issues, but with even strokes of the hand, you can still get the polish to look right. It’s almost a one-coater (it’s a bit thick), but I used 2 for the picture below. 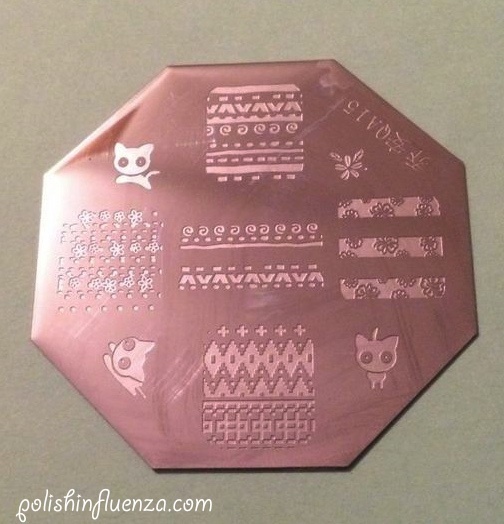 I wanted to spice up my mani a bit, so I proceeded to unwrap my new Born Pretty Store stamping plate QA15 (shown below) for a quick stamp. 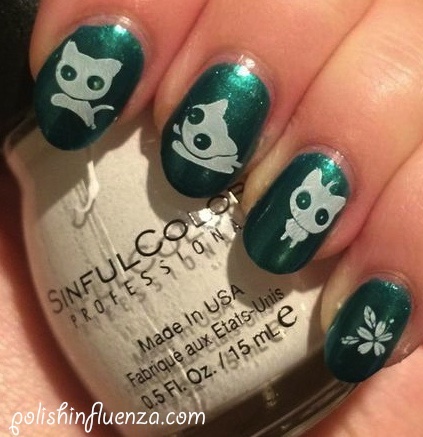 For my manicure, I decided to use the ADORABLE kitten icons and the small flower. I painted over my desired design with Sinful Colors Snow Me White, scraped off the excess, picked up the image, and stamped, giving me the most meow-licious manicure, seen below! So what do you think of the polish, and the plate? Are you a cat person, or would you rather have seen a different design from the plate? Let me know in the comments below! Wet n’ Wild nail polish retails for $0.99-$4.99 a bottle, depending on the nail polish line, and can be found in most chain drugstores, as well as on their website, here. Categories: MOTD, Wet N' Wild | Tags: Born Pretty Store, brushstrokes, cute, Giovanna, kittens, Konad, metallic, MOTD, nail polish, review, stamping, teal, Wet N' Wild, Zoya | Permalink. Happy daylight savings time! I don’t know about you, but I really enjoyed that extra hour of sleep. I’m one of those people who does not wake up unless someone/something interrupts my sleep. I’m pretty sure I wouldn’t wake up otherwise! Today I have a really gorgeous polish from Zoya’s fall 2013 Satins line. It’s called Giovanna, and it is a deep, pure teal. It’s almost metallic, though not enough so to have massive brushstroke issues, but nonetheless, it’s super shiny. This shade of teal reminds me of Caribbean waters far off the shore after they’ve been stirred up by a storm. I know, super descriptive, but that’s the sense I get! It’s got a warmth to it, which makes it perfect for this fall weather! Application wise, it was great, not too thin or thick, and super opaque, almost good in one coat! I used 2 coats for the pictures below, no topcoat. Isn’t it gorgeous? Teals/turquoises are some of my favorite nail polishes out there, I can never have too many! 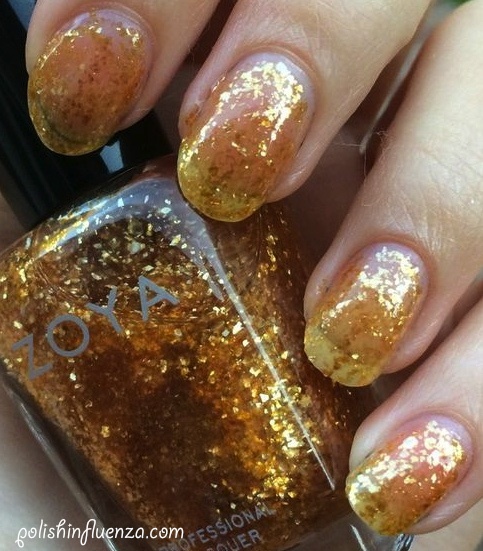 What do you think of this amazing Zoya color? Let me know in the comments below! Zoya nail polishes retail for $7.99-$8.99 a bottle, depending on the line (PixieDust polishes are more expensive), and can be found at beauty supply stores, select salons, and on their website, here. 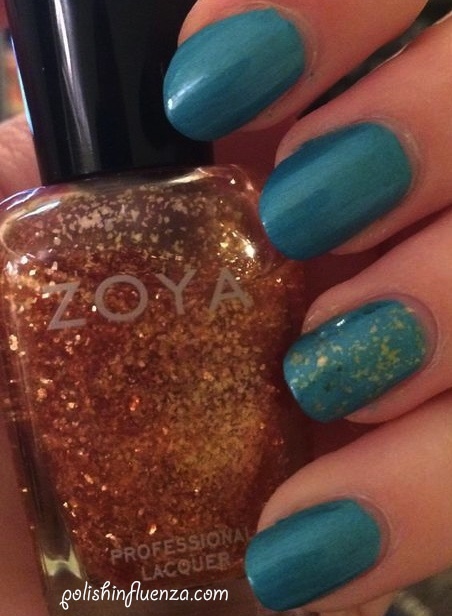 Categories: MOTD, Zoya | Tags: fall 2013, Giovanna, metallic, MOTD, nail polish, review, Satins, shimmer, teal, Zoya | Permalink. Man, is it ever a busy day today. Spanish test, Academic Bowl competition, homework, ugh! I need a break! Luckily for you lovely readers, my breaks usually involve painting my nails/writing blog posts. Here’s the product of my daily relaxation! 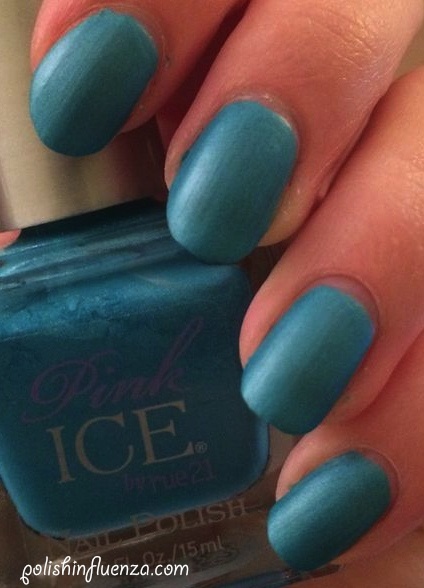 I have a lovely blue to share with you today from Pink Ice by Rue 21, and it’s called 30. Though I love Rue 21’s polish and prices, I really wish they’d name their polishes, even if they were just called “blue” or “pink” or “yellow”. They’d just be easier to store in my stash. Although, I guess most people aren’t obsessive polish hoarders like me…. oh well. 30 is a beautiful, satin finish blue, leaning in the way of turquoise. It’s a very bright blue, with somewhat of a green undertone to it. It dries semi-matte (hence the “satin finish”) which I love with this polish. It makes the nail look like sea glass! Formula-wise, it’s a bit streaky and patchy, but eventually levels out in 3 coats. The first picture is without topcoat, and the second is with topcoat to show it shiny, with Zoya’s Maria-Luisa on the ring finger as an accent nail. I actually think I prefer the matte version of this polish to the shiny version. Maybe sometime I’ll try mattifying Maria-Luisa at some point with this polish, I bet that would look great! Which do you prefer- shiny or satin? Let me know in the comments! Now, I can’t review this polish honestly without mentioning the Godawful brush. Seriously, this brush is a nightmare. ALL of the Pink Ice brushes are. And it makes me so sad because the polishes are so cool with the satin finish. But the brush is permanently stiff, bent out of shape, and makes controlling the polish almost impossible. If you know how to work with with it, it can work, but for a polish beginner? It’s going to be really hard. So, overall, I want to like this polish, but I have to dock it some points for the brush. Have other people who have used Pink Ice polishes had this problem? Let me know! Pink Ice polishes retail for $3.99, but are often on sale for a 2 for $5 deal at Rue 21 store locations, and can be bought at Rue 21 stores and on their website, here. Categories: MOTD, Pink Ice | Tags: blue, brush, Maria-Luisa, matte, MOTD, nail polish, Pink Ice, satin, turquoise, Zoya | Permalink. Happy hump day! This week is dragging by for me, I hope it’s going better for you! After a day jam-packed with tests, I needed some pink polish to brighten my day, and thankfully, I got it! I know I’ve been posting a LOT of Zoya recently (and there’s more coming!) but I could NOT resist posting this color today. I was at Ulta over the weekend, and they were having a buy 2 get 1 free sale on their luxury brand polishes, and I ended up getting 3 Zoya colors, and this was one of them! So let’s get started with the polish! Sarah (which also happens to be the name of my lovely sister) is a rich, reddish pink sparkler. 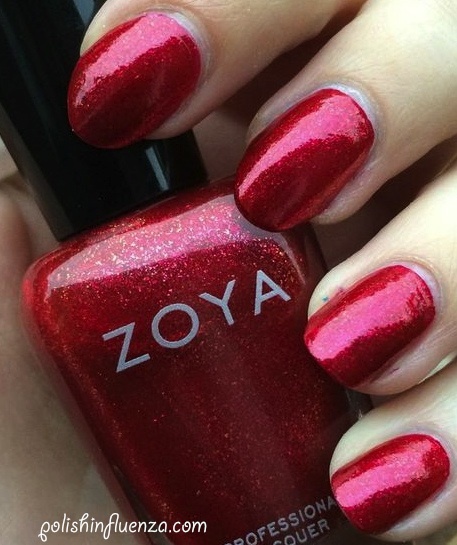 It’s from the 2010 holiday collection, which the Zoya website lists as the “Flame” collection, but I’ve also seen it referred to as the “Fire and Ice” collection. In the bottle, it looks like it has some gold running through it, but I’m having a hard time finding it on the nail. Nonetheless, this polish still has a huge amount of depth- there are tiny bright fuchsia glitters amidst a darkened raspberry base. It’s a stunner! It almost looks squishy, even though it’s not a jelly at all. 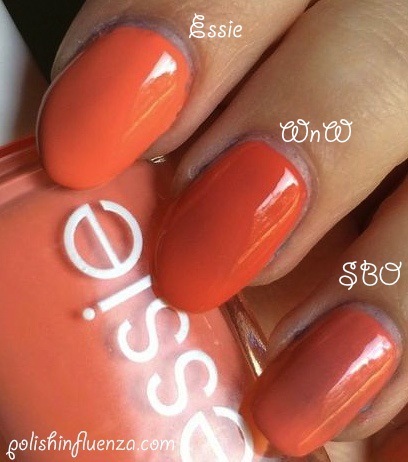 It has a great formula, applies easily, almost opaque in one coat! No patchiness or streaking. Pictures below are two coats of Sarah with no topcoat. I love bright colors like this! It’s not necessarily what you would call a “fall” color, but in my opinion, pinks like these are a staple that can be worn year round! My nails look like plump, juicy berries! 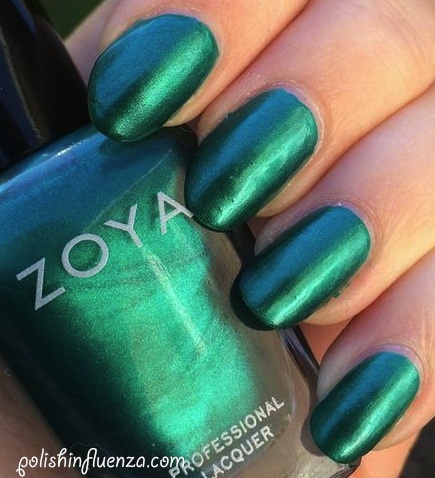 Are you a fan of this Zoya gem? Let me know in the comments! 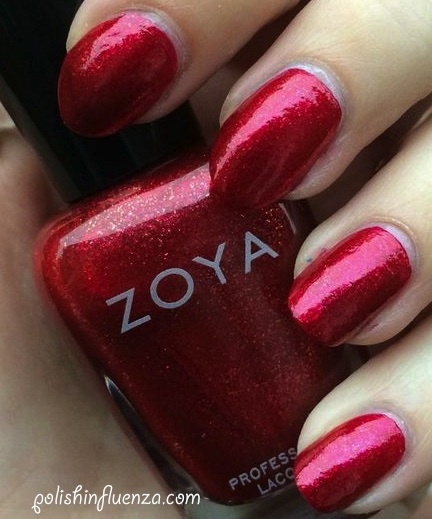 Zoya polishes have a recommended retail value of $7.99-$8.99 a bottle, and can be found at select beauty supply stores, and on their website, here. Categories: On Wednesdays We Wear Pink, Zoya | Tags: Fire and Ice, Flame, fuchsia, glitter, gold, holiday 2010, magenta, Mean Girls, MOTD, nail polish, on Wednesdays we wear pink, pink, Zoya | Permalink. It’s Monday once again! I had my first college interview today, and impressed the interviewer with my nails! Never underestimate the power of nail polish, people. It can change the world! And you guys are going to love the world-changing nail color I have for you today! I’ve been lemming Zoya’s Maria-Luisa ever since it was released with their fall collection this year. It’s a gorgeous gold flaky glitter in a slightly yellow-tinted base. It’s somewhat thick due to the glitter density, but it’s still perfectly usable. While the entire Cashmeres/Satins collection was (and still is) to die for, THIS color was the one I knew I needed, no matter what, and it’s finally mine! And it lives up to my expectations. It’s really meant to be a topcoat, but I decided to try it out on its own. This picture is with 2 coats. Yeah, I know, not good looking. However, it’s a whole other story overtop of other colors! I chose a wide variety of colors to swatch Maria-Luisa over. I have Sinful Colors Snow Me White on my thumb, e.l.f.’s Flirty Fuchsia on my pointer finger, Sally Hansen Complete Salon Manicure’s Nightwatcher on my middle finger, Sally Hansen Complete Salon Manicure’s New Wave Blue on my ring finger, and Love and Beauty’s Purple on my pinky, each with one coat of Maria-Luisa overtop in pictures below. I really like the pairings I’ve chosen, especially ML over Snow Me White, the gold really stands out! My other favorite is definitely ML over Nightwatcher, the deep navy creme makes the gold glitter look like a smattering of little shiny stars! Which combo is your favorite, and what color combo did I miss that you’d like me to try? Let me know in the comments below! Maria-Luisa is a great alternative to the super expensive gold leaf topcoats out there. OPI’s The Man With the Golden Gun had a suggested retail value of $30 when it was available in stores, and now it’s hard to find it at all under $75! While ML isn’t a perfect dupe for real gold leaf, it does give a similar effect at the fraction of the real thing’s price, so it’s definitely worth checking out for all my polish sisters on a budget! 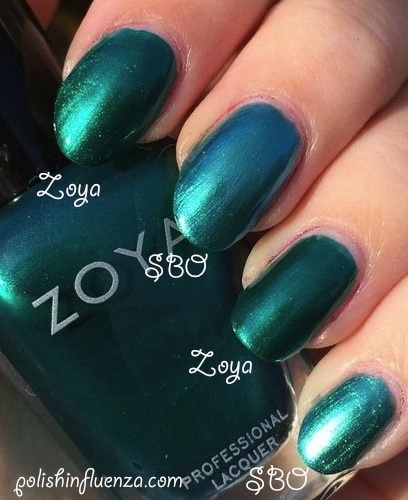 Maria-Luisa is a part of the Zoya “Satins” fall 2013 collection, and has a suggestion retail price of $8-$9, as do all regular Zoya polishes. 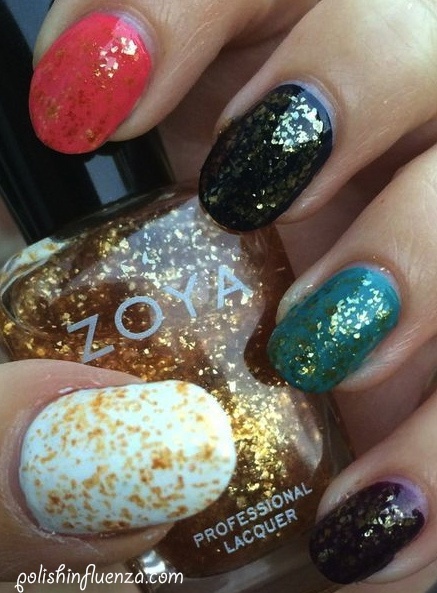 Zoya can be found at select beauty supply stores, as well as on their website, here. 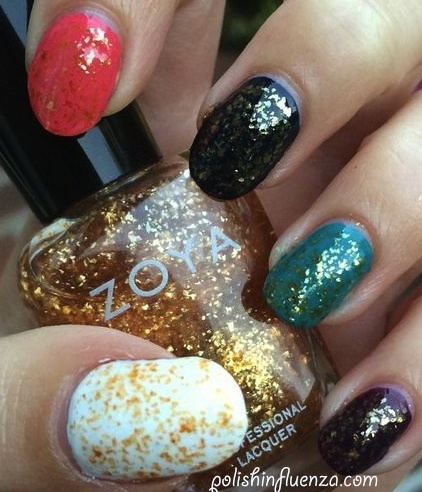 Categories: MOTD, Zoya | Tags: autumn, fall, fall 2013, glitter, gold, gold leaf, Maria-Luisa, MOTD, nail polish, Satins collection, sparkle, topcoat, Zoya | Permalink. 31DC2013 Day 13- Animal Print! I’ve got to admit- I wasn’t very inspired for today’s challenge… Animal print just isn’t really my thing. There are so few choices for it. There’s cheetah, zebra, giraffe, and cow, and they’ve all been time a million times over. That’s not to say that they aren’t beautiful designs, but they’ve all been done. It was a struggle to come up with a creative design, but I hope I’ve succeeded! Today, I really wanted to incorporate texture into my nails. I recently purchased one of Zoya’s new Pixie Dust lacquers, and I really have wanted to try it out! The color I purchased is called Carter, and it’s a gorgeous purple glitter in a deep blurple base, with beautiful red and pink shimmer in it (but more on that in a later post- I’ll definitely be reviewing it on its own). I decided it would look good as the center of a cheetah print design. I love the color combo of purple and teal, so I chose a satin-finish teal color by Rue Beauté, color 136 (it smells like cotton candy! Yum!). Once it dried, I dabbed small patches of Carter on top, and let it dry. Then, I used Sinful Colors Snow Me White to outline the design. I used a toothpick to draw “C” shapes and lines around the purple spots, and added some individual white spots to the design to make it feel more authentic. While I’m not a fan of animal print, I do like how this turned out! Pictures below are without topcoat. If you like this design, please like and share it! And please, share your designs with me! 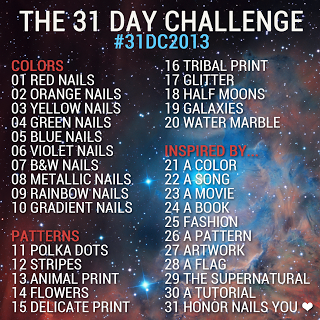 We’re all in this 31DC2013 together- let’s all support each other! Tomorrow is flowers day! There’s so many things you can do! I can’t wait to be inspired! 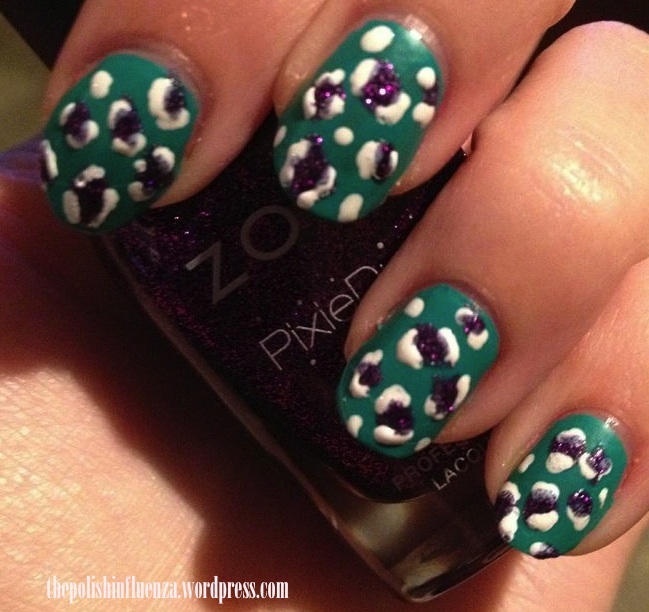 CLICK HERE TO VIEW OTHER NAIL ARTISTS’ ANIMAL PRINT DESIGNS!!! 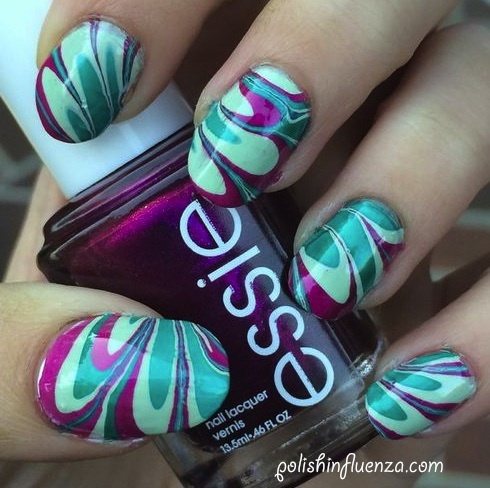 Categories: 31 Day Challenge 2013, 31DC2013, Nail Art | Tags: 31DC2013, animal print, cheetah, Pixie Dust, purple, Rue Beauté, Sinful Colors, teal, white, Zoya | Permalink.